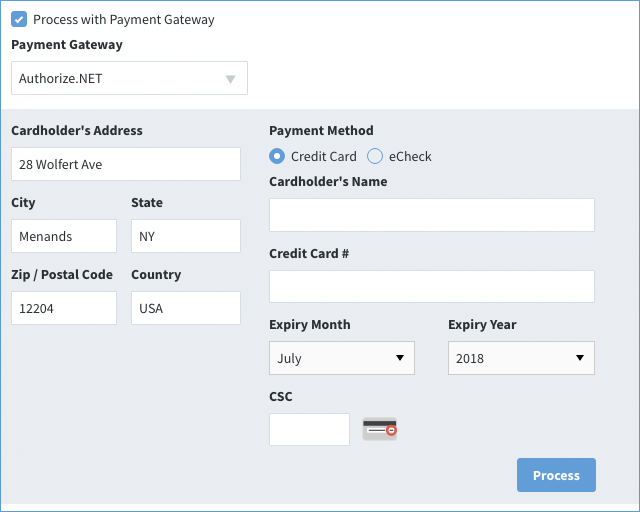 How to use Sales Receipts if Method is connected to QuickBooks Desktop. 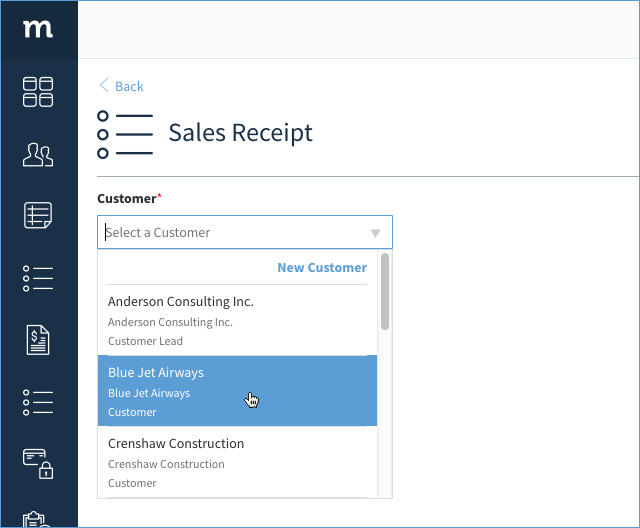 A Sales Receipt can be created in Method using the Sales Receipts App. This article will explain the different parts of the Sales Receipt screen. 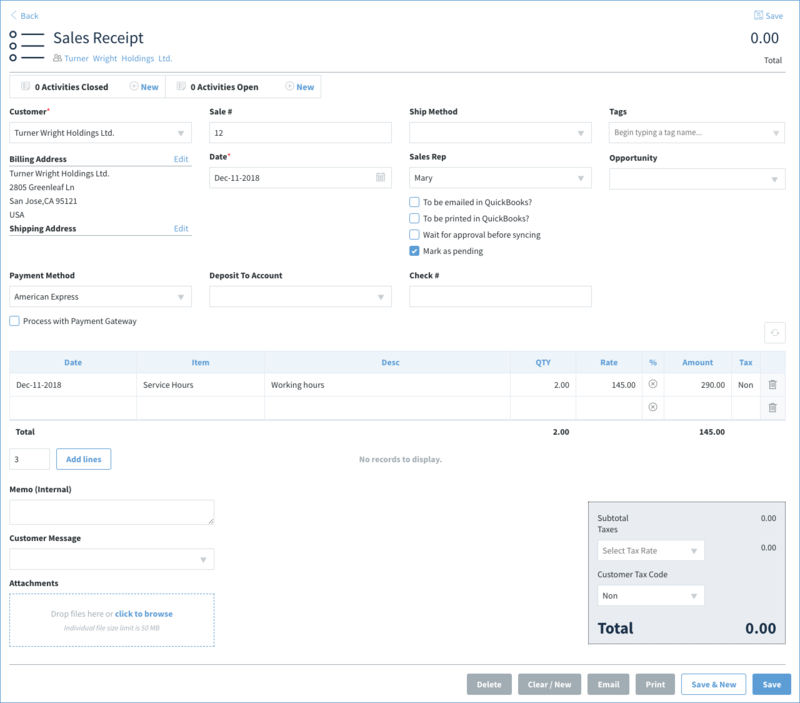 Note: There are minor differences in creating a Sales Receipt for Method depending on whether or not you have QuickBooks Desktop, or QuickBooks Online. 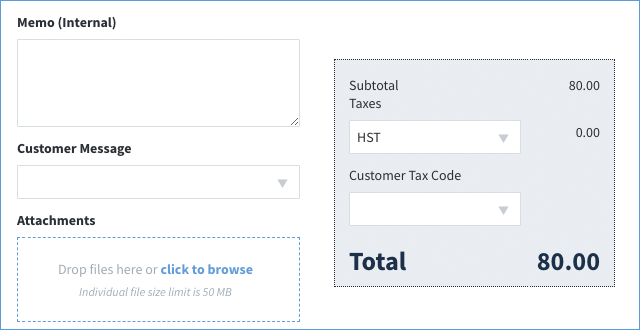 If you are using QuickBooks Online, please see our article Create a Sales Receipt in Method for QBO Accounts. 1. 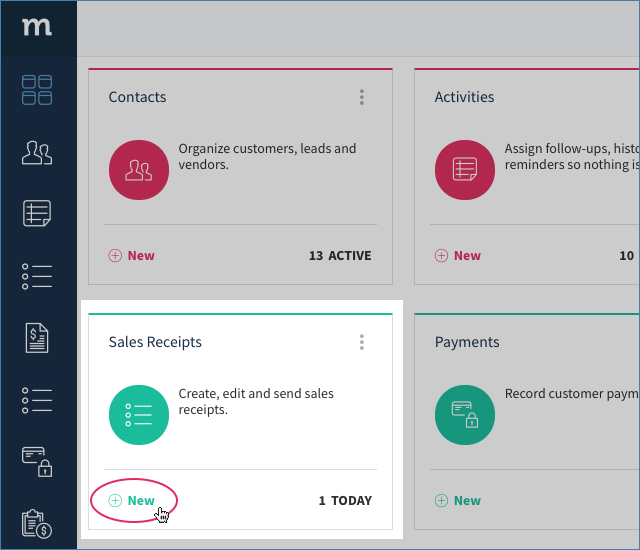 To create a new Sales Receipt, click ⊕ New on your Sales Receipts App, or click ⊕ New Sales Receipt from your Sales Receipt List. 2. This opens your New Sales Receipt screen. Choose a customer to associate with this receipt. This opens up more fields to be filled out. 4. Next, the following fields, other than the Date, are optional. Sale #: Will be auto-calculated either by QuickBooks or Method if left blank. Ship method: Determine how the product will be shipped, if applicable. Class: The class you wish to assign this to. Sales rep: Assign a sales rep.
To be emailed in QuickBooks: Flags the sales receipt in QuickBooks as "to be emailed"; group and email multiple sales orders in QuickBooks. To be printed in QuickBooks: Flags the sales receipt in QuickBooks as "to be printed"; group and print multiple sales orders in QuickBooks. Wait for approval before syncing: Prevents the sales receipt from syncing to QuickBooks until a user unchecks this option and saves. Mark as pending: Flags the sales receipt in QuickBooks as "pending"; do not send this receipt to the customer yet. 5. The next fields deal with payment options. Payment Method: Type of payment. Deposit to Account: Choose the bank account the payment will initially be deposited in. This field is populated by QuickBooks. Check #: Assign a check number if applicable. The Check # will be filled with the appropriate reference number from the payment gateway. Line items are added to the Sales Receipt using the Line Items grid. Items available are taken from the Items App which is synced with your QuickBooks account. By clicking on a row, each column (other than the Amount) can be edited to fill in details for each line item. 1. 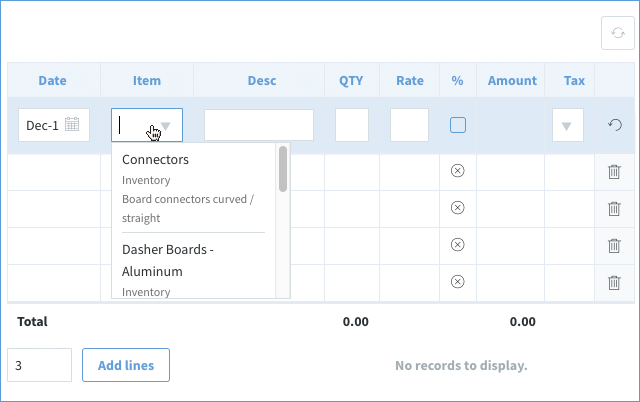 Click inside the line item to grid to add QuickBooks items to this sales receipt. To add more lines, select the Add Lines button. If you are viewing on mobile, adding new items is done via a separate screen. Notice, line items are not saved until you save the whole Sales Receipt. If you updated the line items and log out of your session, they will not be saved in the Sales Receipt. At the bottom of the screen, you will see your total as well as other details. Memo (Internal): A note you can leave to you and your staff which will not be seen by the customer. Customer Message: A note the customer can see. Attachments: You can attach any file to this particular sales receipt. Taxes: Select a tax rate for this sales receipt. Customer Tax Code: Enter in the tax code if applicable. Delete: Delete your sales receipt. Note: Deleting a sales receipt cannot be undone. Clear / New: Clear all the fields on the screen to enter in a new sales receipt. Email: This will email the sales receipt to the customer. You will get a preview of the email before sending. Print: This will bring up a pdf document of the sales receipt for printing. Your pop-ups must be enabled for Method, else the document will be blocked and nothing will happen when you click this button. Save & New: Save this sales receipt and clear all the fields to enter in a new sales receipt. Save: Save the sales receipt and stay on the screen. Once saved, your sales receipt will be visible in your Sales Receipt List.